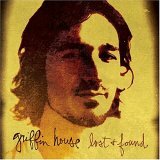 Griffin House begins his full-length debut Lost & Found with an electric guitar’s hushed reverberations, which float pensively over the faint hum of a synthesizer. It perfectly sets the tone for what follows: a soft, gentle stroll through a series of Americana-tinged, folk-pop songs about relationships that occasionally are interrupted by an ethereal blast of stadium-sized rock. Through it all, House wears his influences on his sleeve, borrowing heavily from the playbooks of Bruce Springsteen (Liberty Line), Jeff Buckley (Waterfall), and U2 (New Day), but although he aims for the farthest reaches of the sky, the arrangements that envelop his material frequently fall flat. For every tune that works, there are two that don’t, and when his lyrics falter, they can be downright laughable. That said, House is only 24 years old, and he didn’t start playing guitar or writing songs until he was in college. In other words, he’s just getting started, and if the music business does what it’s supposed to do — which is to nurture his artistic inclinations — he just might make it. Lord knows, House has the ambition to succeed, but talent, well...that takes time to mature. Consequently, Lost & Found is a routine and frequently pedantic exercise that currently bears little fruit, yet holds plenty of promise. Lost & Found is available from Barnes & Noble.